A demon's son for your collection! Detailed action figure from Capcom's Devil May Cry 3. 11 1/2-inch tall Vergil features 32 points of articulation. Includes interchangeable hands, a tailored cloth outfit, and 2 swords! This authentic likeness of Vergil from Capcom's Devil May Cry 3: Dante's Awakening game stands about 11 1/2-inches tall and features an Asmus Toys KP01A+ plastic male body with over 32 points of articulation. He comes with 3 pairs of interchangeable hands, an extremely detailed tailored cloth outfit that includes his signature blue coat, 2 swords, and a figure stand for easy display. 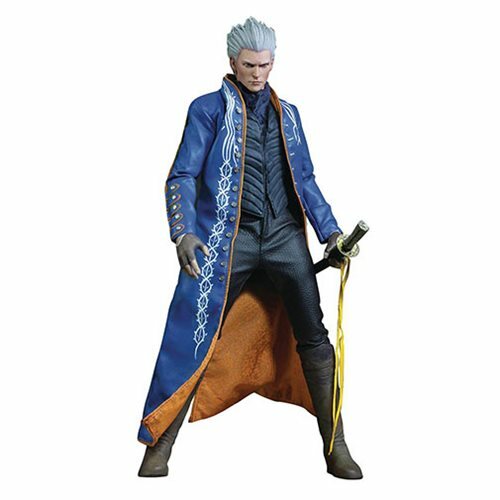 Add this fantastic Devil May Cry 3 Vergil 1:6 Scale Action Figure to your Devil May Cry collection today!